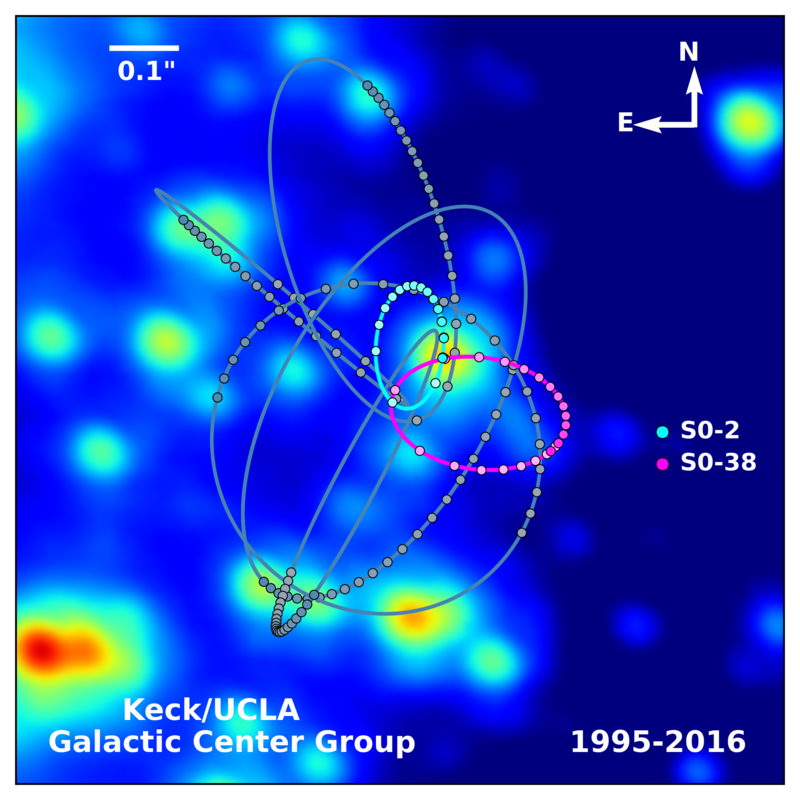 The orbit of S0-2 (light blue) located near the Milky Way’s supermassive black hole will be used to test Einstein’s Theory of General Relativity and generate potentially new gravitational models. No companion found for famous young bright star orbiting Milky Way’s supermassive black hole SgrA*. Astronomers have the “all-clear” for an exciting test of Einstein’s Theory of General Relativity, thanks to a new discovery about S0-2’s star status. 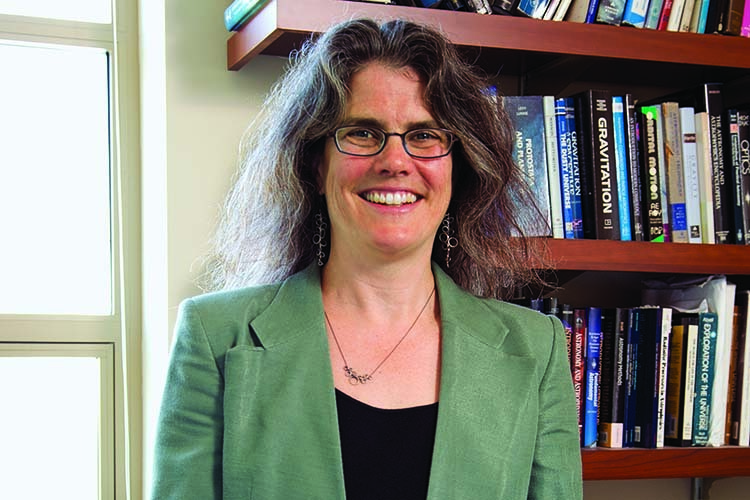 Tags: Andrea Ghez UCLA, Astrobites ( 298 ), Astronomy ( 7,546 ), Astrophysics ( 4,681 ), Basic Research ( 10,439 ), Cosmology ( 4,872 ), Is S0-2 a Binary Star? S0–102 is a star that is located very close to the centre of the Milky Way, near the radio source Sgr A*, orbiting it with an orbital period of 11.5 years. As of 2012 it is the star with the shortest known period orbiting the black hole at the centre of the Milky Way. This beat the record of 15 years previously set by S0–2. The star was identified by a University of California, Los Angeles team headed by Andrea M. Ghez. At its periapsis, its speed exceeds 1% of the speed of light. At that point it is 260 astronomical units (36 light hours, 38.9 billion km) from the centre, while the black hole radius is less than one thousandth of that size (11 million km). It passed that point in 2009 and will be there again in 2020. The next time S0-2 will reach its closest approach to the black hole, in 2018, there will exist a unique opportunity to detect a deviation from Keplerian motion, namely the relativistic redshift of S0-2’s radial (line-of-sight) velocity, in a direct measurement. In anticipation of this event, the authors of today’s paper investigate possible consequences of S0-2 not being a single star, but a spectroscopic binary, which would complicate this measurement. Figure 1: Top: Radial velocity measurements of S0-2 over time. Bottom: Residual velocities after subtraction of the best-fit model for the orbital motion. To search for any periodicity in S0-2’s radial velocity curve that would indicate the presence of a companion star, the authors combine their most recent velocity measurements with previous ones obtained as part of monitoring programs carried out at both the WMKO in Hawaii and the VLT in Chile. 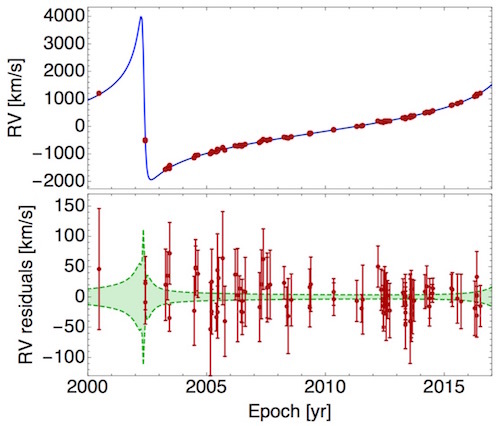 The resulting data set consists of 87 measurements in total, which are spread over 17 years of observations and have a typical uncertainty of a few 10 km/s (Figure 1, top panel). When S0-2 passes the black hole, the relativistic redshift of its radial velocity is predicted to amount to roughly 200 km/s at closest approach, while the radial velocity is expected to change from +4000 to -2000 km/s. S0-2’s actual speed at this time will be close to 8000 km/s, about 2.7% of the speed of light. See more at the full article. Ghez and her co-workers analyzed extremely sharp images of the center of our galaxy taken with Keck Observatory’s adaptive optics (AO). Ghez used this cutting-edge system to track the orbits of stars near the supermassive black hole located at the center of the Milky Way. Their stellar path, driven by gravity created from the supermassive black hole, could give clues to the fifth force. The orbits of two stars, S0-2 and S0-38 located near the Milky Way’s supermassive black hole will be used to test Einstein’s theory of General Relativity and potentially generate new gravitational models. IMAGE CREDIT: S. SAKAI/A.GHEZ/W. M. KECK OBSERVATORY/ UCLA GALACTIC CENTER GROUP. 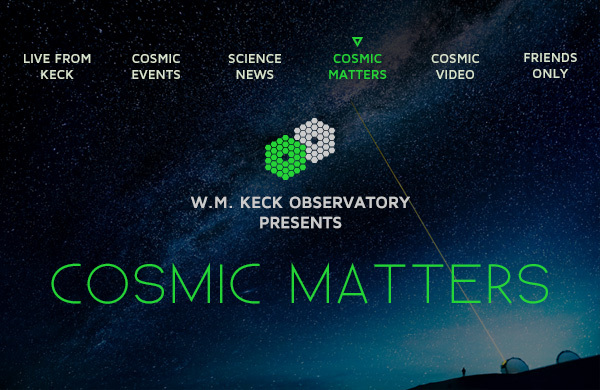 W. M. Keck Observatory is a distinguished leader in the field of adaptive optics (AO), a breakthrough technology that removes the distortions caused by the turbulence in the Earth’s atmosphere. Keck Observatory pioneered the astronomical use of both natural guide star (NGS) and laser guide star adaptive optics (LGS AO) and our current systems now deliver images three to four times sharper than the Hubble Space Telescope. AO has imaged the four massive planets orbiting the star HR8799, measured the mass of the giant black hole at the center of our Milky Way Galaxy, discovered new supernovae in distant galaxies, and identified the specific stars that were their progenitors.